Soil remediation at the Quanta Resources Superfund Site was suspended pending demolition of the 115 River Road Building (not including the pier building). This update provides an overview of the demolition. 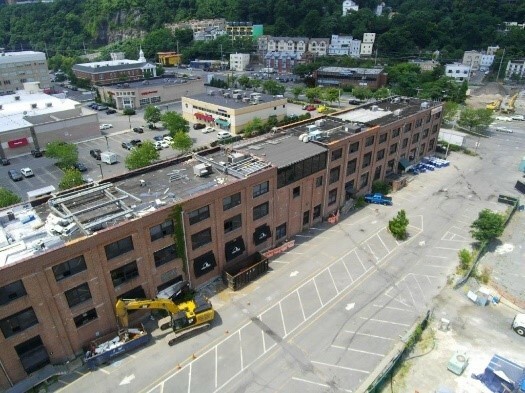 The 115 River Road Building was a two-three story former industrial building extending from the Hudson River to River Road. It was constructed over time as a series of nine structures that appear to be one building. Demolition of the building has been completed and remaining debris is being removed. Honeywell oversaw the demolition of this property. Demolition was planned in sections, working east to west, from the Hudson River toward River Road. NorthStar, the abatement contractor, certified that asbestos and waste were completely removed. Only the building itself was demolished. All sub-surface areas were left in place and will be addressed when soil remediation resumes. Although not required by local, state, or federal ordinances, a community air monitoring plan, approved by the United States Environmental Protection Agency, was implemented during demolition. Eight “real-time” fixed air monitors at the perimeter measured dust with “alert” and “action” levels. The placement of the monitors provided coverage for wind coming from any direction. Action Levels: Air quality parameters were established at 150 μg/m3 based on a 24-hour average exposure using the National Ambient Air Quality Standard. For this project a more conservative action level of 150 μg/m3 over a 15-minute average was used. Alert Levels: An early warning level (100 μg/m3) over a 15-minute period. 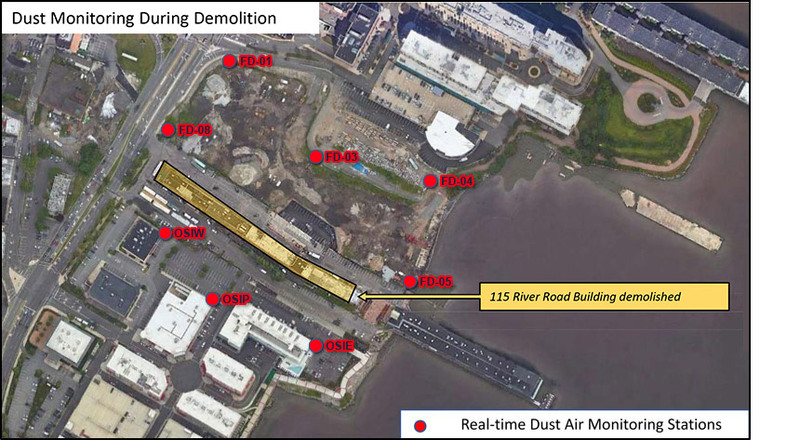 Results of air monitoring for dust during demolition, which began on September 12, 2018, can be found on the interactive map below. In addition, dust suppression techniques were implemented during demolition. To view the data collected, select a date from the drop-down list and click “Change” (dates not shown in the list have no data available). Then, move your cursor over a monitor icon to view the data.